Build multiple sites - from one page marketing pages to multi-page menu based sites. Share your headers and footers across your sites. Learn how to create a new site. 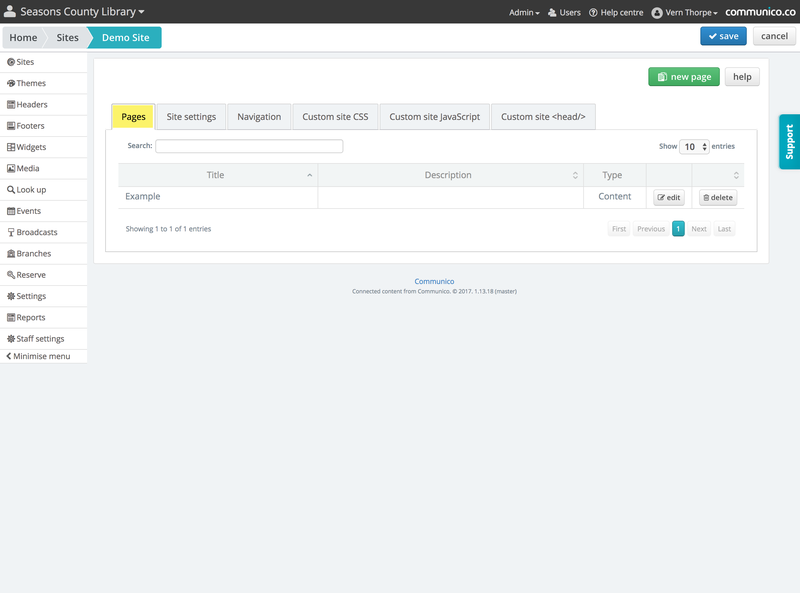 Set a header, footer and theme and create your navigation. Learn about default site settings. 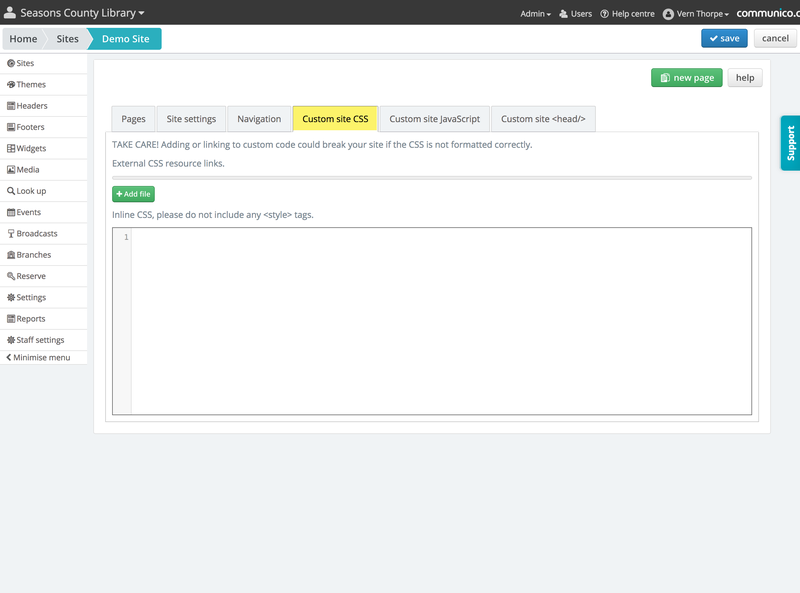 Create and manage site navigation. Learn the basics of Sites with step by step illustrated guides. In the Sites section, click the New site button, where you can configure your site settings and navigation, ready to add headers, footers and pages. 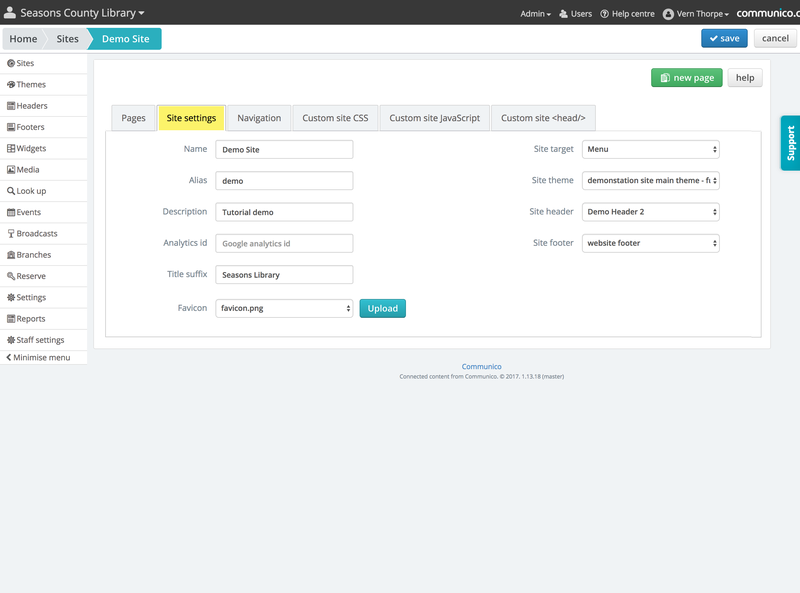 Under the Site settings tab, you'll configure your site, and set various site defaults. Give your site a name and an alias, which will appear in the URL after the first part of your website address. Add a description if needed to help you to identify this site among the others that may be in your listing. If you have a Google Analytics account, enter your Google Analytics Tracking ID, and you'll be able to track this site. Upload your own favicon (32x32 px) to replace the default Communico logo in the browser tab. Set the Site target to determine whether this is a single page site (eg. a signposting startpage) or a website with multiple pages and a navigation menu. Set the default Site theme, Site header and Site footer, by picking from the dropdowns. These will then apply automatically across the site, unless changed individually at the page level, which can be done when creating or editing a page. The themes, headers and footers are created separately, under their respective areas of the control panel. Under the Navigation tab, you'll build up a navigation menu for your multiple page site, to enable users to access your content. One section will already appear, to serve as your homepage. Click + Add section to add more tabs, and continue to build up your top level of navigation. You can reorder the menu by simply grabbing and dragging a tab into a new position. To populate a section, enter a title, which will automatically appear in the section label. You can then set the section to link to a page, or to become a submenu. External - link this section to any external page, not created in the CMS. Just enter the URL. To add subnavigation to a section, change the Section type to Menu. Select the menu type, either Flyout, Half width or Full width. For a full width menu, you can constrain the vertical length of your submenu by choosing to break it down into columns. Just set a maximum number of items per column on the Max per column slider, and it will automatically divide your menu if it gets too long. Build up your submenu by clicking + add item and linking each item to an internal or external page. Again, items can be reordered by simply dragging and dropping. You can also create subheadings within your submenu. Create the heading by adding an item with no link, and then simply drag and drop other items to nest them underneath. If you use Attend and/or Reserve for your event programming or room scheduling, you can link to your predesignated Attend and Reserve pages by setting the link to External, and into the URL field, enter /events for Attend, or /reserve for Reserve. 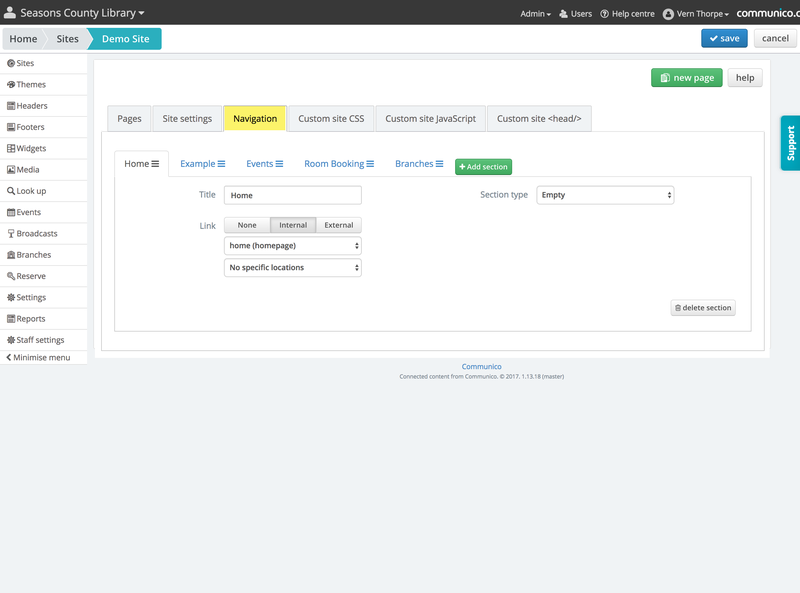 See the pages section for details on how to create and manage your site pages using the cms page builder. This allows further customization to pages, widgets and other elements that only affect single sites. Under these tabs, you can either add code, or link to a file. Note: TAKE CARE! Adding or linking to custom code could break the site if the code is not formatted correctly.